Visitors to Kachemak Bay often get confused--and amazed --by the bay's extreme tides. People who don't live on the ocean have a hard time understanding a bay where the difference between the highest high tide and the lowest low tide is more than 28 feet! This Earthcache is accessible by wheelchair. However, portions require you to descend the ramp. 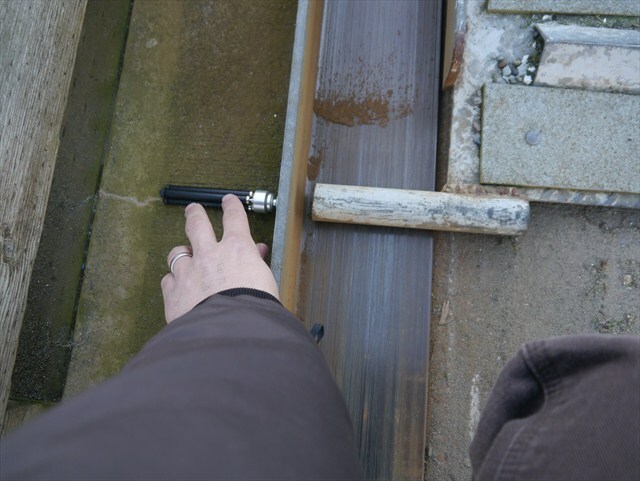 This can be very steep at times, but a ramp provides access to the necessary recording site. Please use your best judgement when using the ramps. DO NOT PLACE YOUR ANSWERS IN YOUR ONLINE LOG. Email us through our account with your answers. Do take the time to read the entire listing for details about how to answer the questions completely and properly. Instructions are provided below about how to complete the measurements required. You will need to read through the entire description to have an understanding of how to find the answers to this Earthcache. This cache listing goes through a step-by-step process. Read through it as you complete the requirements for this cache. Please do not post any answers in your log. It will be deleted, and you will need to resubmit the log without spoilers. Read on to find out how to understand the questions and how to answer them correctly. You will need to visit more than one location to complete the logging tasks. For the current tides, visit this site. For high and low tide predictions, please visit many of the local vendors and ask for a tide book. So what makes the tides in Kachemak Bay so interesting? Kachemak Bay’s tides are some of the largest in the world. The average vertical difference between high and low waters is 15 feet, with an average high tide of around +18 feet. Tides can be as high as +28 feet in Kachemak Bay! 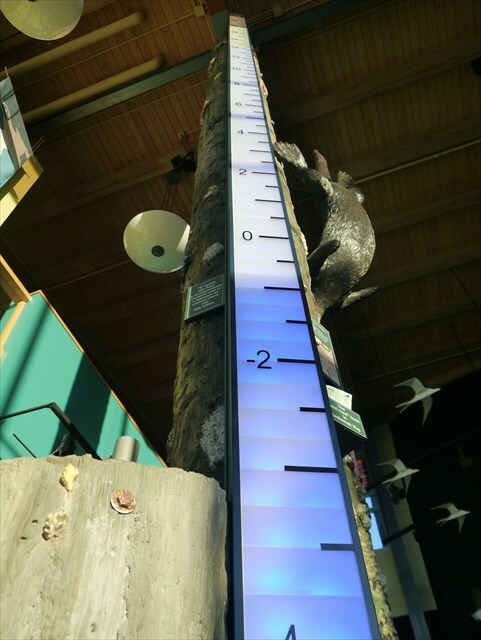 Thankfully, the Kachemak Bay Research Reserve and the Alaska Maritime National Wildlife Refuge collaborated an exhibit at the Alaska Islands and Ocean Visitor Center that illustrates local tidal ranges. As it happens, the height of one of the steel pillars supporting the roof of the Islands and Ocean main lobby is just over 31 feet. The tidal column exhibit wraps around one of those pillars, a sculpture of a post encrusted with sea creatures and a lighted, numbered gauge showing the tide at any moment from a minus (-)4.5 foot low tide at the floor to a +24 foot high tide. Be sure to stop by to learn more about the tides of Kachemak Bay. People have a lot of misconceptions about the tides in Kachemak Bay, however. One common misconception is that Kachemak Bay has the “second most extreme range of tides in the world”. That's not true--at least by how NOAA defines extreme range of tides. While Seldovia, Homer's nearest official tidal station, has an extreme range of record high and low tides of 32.68 feet, NOAA looks at the mean range between tides. That's calculated by taking all the high tides for a 13-year period and averaging them, taking all the low tides for that period and averaging them, and then calculating the difference. The Bay of Fundy, Nova Scotia, holds the record, for a mean range of 38.4 feet. Ungava Bay, Quebec, is second with a range of 32 feet and Bristol, England, is third with a range of 31.5 feet. Turnagain Arm is number four at 30.3 feet. Kachemak Bay has a mean range of 15.83 feet--not even in the top 10. Tidal currents can be very strong, and rapids are often created in narrow passages, such as the entrances to Halibut Cove and Tutka Bay lagoons. Tide books, available at sporting goods stores, are essential for beachcombing, boating and fishing. (Be sure to use the Seldovia tables!) On some days at low tide, Beluga Slough will appear as a grassy wetland, ready to be traversed on foot. Just 6 hours later, tides can rush in and cover the entire Slough. When the tide goes out again, it can rush from the Slough at an amazing rate! The beaches around Homer can extend for hundreds of yards at low tide, and then be under many feet of water a short time later. Everything from fishing to clamming, sightseeing to beachcombing, accessing your boat to landing your boat are all impacted by these extreme tides. Wait a second, so how does this work? The biggest effect on tides--and what causes them--is gravity; the effect of the moon and the sun. Although the sun has more mass than the moon, it's farther away and its effect is dampened by distance so the sun has about half the effect as the moon. Oceans covering the earth get pulled toward the moon and sun, creating a tidal bulge. On the other side of the earth, inertia--what causes coffee to slosh out of a cup when a car makes a sudden stop--pulls the ocean the opposite direction. The combination of inertia and gravity create two tidal bulges, or the tides. Tides produce oscillating currents known as tidal streams. The moment that the tidal current ceases is called slack water or slack tide. The tide then reverses direction and is said to be turning. Slack water usually occurs near high water and low water. But there are locations where the moments of slack tide differ significantly from those of high and low water. Tides are most commonly semi-diurnal (two high waters and two low waters each day), or diurnal (one tidal cycle per day). The two high waters on a given day are typically not the same height (the daily inequality); these are the higher high water and the lower high water in tide tables. Similarly, the two low waters each day are the higher low water and the lower low water. The daily inequality is not consistent and is generally small when the Moon is over the equator. The earth is closest to the sun on Jan. 2 and farthest on July 2. The northern hemisphere is tipped closest to the sun on June 21. All of these factors affect tides at any time in the year and at any location, too. The average tidal range of all oceans around the globe is 3ft, yet Kachemak Bay ranges about 16ft. Kachemak Bay Tides: Bring on the Geology! This tidal phenomena exists because the Bay has a few distinct features: a substantial amount of water and a unique shape and size that causes “resonance”. …Ok, get out your reading glasses, and buckle up. It’s time to get your science on! A liquid in a basin has a characteristic period of “oscillation” and, once set in motion, the liquid will rhythmically slosh back and forth in this time period. The surface rises first at one end, then at the other, while the level in the middle remains nearly constant. The speed at which it oscillates depends on the length and depth of the basin. On a small scale, picture water sloshing around in a bathtub. It takes just seconds to slosh back and forth. Due to the large size, the unique funnel shape, and the depth of Kachemak Bay, its natural period of oscillation is somewhere between 12 and 13 hours. This oscillation is most often in sync with the surrounding tides, and so the sloshing is amplified—or resonated--by that effect. The bay’s shape and bottom topography also have a secondary influence on the tides. 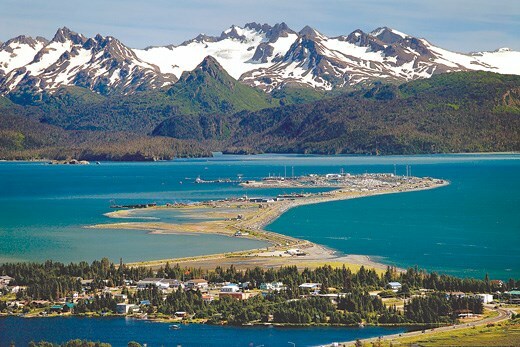 Really, our tides here in Kachemak Bay can be simply attributed to the one thing extreme tidal areas have in common: The bay is shaped like a large natural funnel; it becomes narrower and shallower towards the upper part of the bay, forcing the water higher up onto the shores. An important part of why Kachemak Bay is shaped like a funnel is because of how it formed. 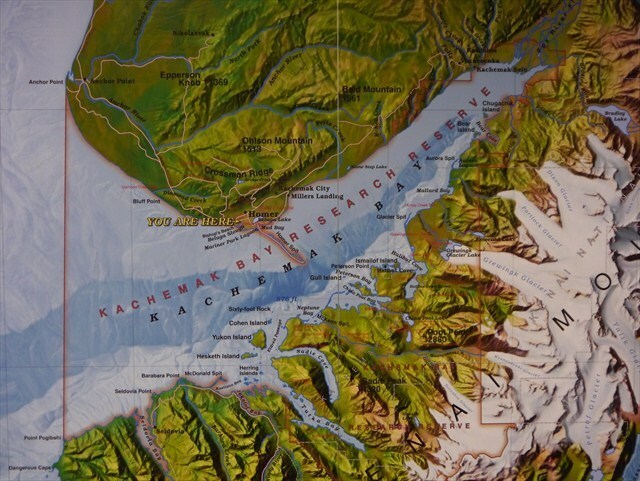 Thousands of years ago, during the last Ice Age, Kachemak Bay was filled with a giant glacier. You can imagine how large it was when you look from the bluffs to the north and then to the mountain range to the south. That glacier carved the bay to the depth and width you can see in the map below, leaving behind a trademark "u-shaped valley". This valley filled back in with sea water as the glacier melted and receded back into the mountains at the head of the bay. Remnants of this glacier can still be see above water when you look at the Homer Spit and Beluga Slough. Vertical Tidal Effect, and Horizontal Tidal Effect. Visit an area about 6 hours apart while you’re here in the Bay. The vertical effect can be seen when you watch the walkways on the docks in the small craft harbor rise and fall by more than 20 feet on some days—creating a flat walkway, or a steep staircase. The horizontal effect can be seen most clearly at a low tide here in Homer, when hundreds of yards of mud and sand are exposed out into the ocean. Again, you’ll need to visit the same area twice, six hours apart, to truly admire this remarkable sight. In just over six hours the tides can expose a vast expanse of ocean floor, and drop boats almost 4 stories in the harbor! How about seeing how extreme the tides are? At the end of this walkway you will find a ramp. 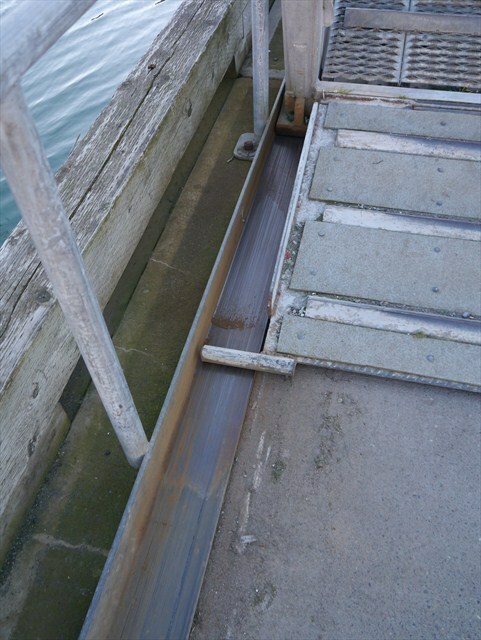 This ramp can provide nearly flat access to the boats docked below at a high tide. At a low tide, this ramp can become very, very steep. In a matter of 6 hours, this “elevator” goes from the top floor to the bottom floor. But just how fast does it move? The answer to this question will depend on conditions like the height of the high tide, and the height of the low tide. But, you can see for yourselves just how fast the tides move here in Kachemak Bay! First, find a stick, pencil, or other object that you can leave at the site for a little while. 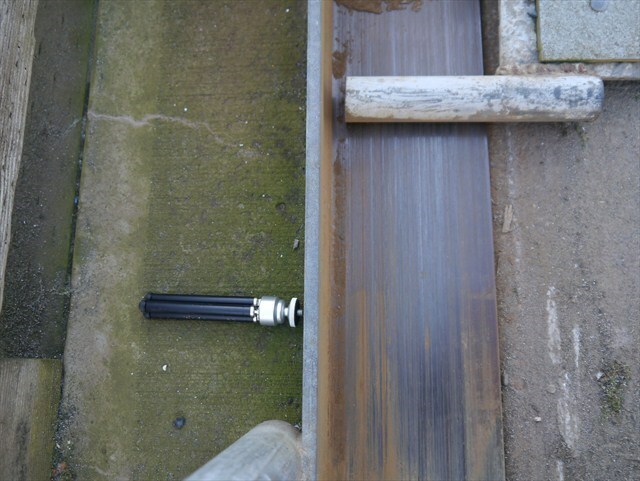 Next, go to the bottom of the ramp, and find where there is a metal peg inside a bracket. Next, place your object next to where the pin currently sits in the bracket. Place your object next to the pin. Then, take a walk, go fishing, or whatever you like for a little while. You only need 10-15 minutes to wait to see a change. We recommend that you walk along the docks instead of up on the road. That way, you can enjoy looking at the ships and small craft in the harbor while you head over to the "QA" waypoint. You only need 10-15 minutes away from the ramp to get a reading for the required questions. If you leave for more than a couple of hours, your numbers will not make sense! Once you have gone to the QA coordinates and taken a break to let the tides do their thing, return to the bottom of the bottom of the ramp where you placed you marker object. Take a look to see how far the ramp has moved, and estimate the length of movement. Now that you’re back, see how far the ramp moved! Don’t forget to keep track of how long you were gone. Sometimes all it takes is a few minutes to see a difference. However, it’s much more dramatic if you go for longer, however. Just don’t forget about it! -What date and time of day was your visit? -Was the tide coming in (flood tide), or going out (ebb tide)? -Though not required, please post a photo of the ramp’s angle from the tide when you visited. This Earthcache was placed with permission from the Homer Harbormaster, and in accordance with cache placement and Earthcache guidelines. Va gur ernqvat, naq lbhe bofreingvbany gnfxf. Come back later to see how far the pin has movedKeep track of how long you're gone, and measure how far the pin moved in that time. 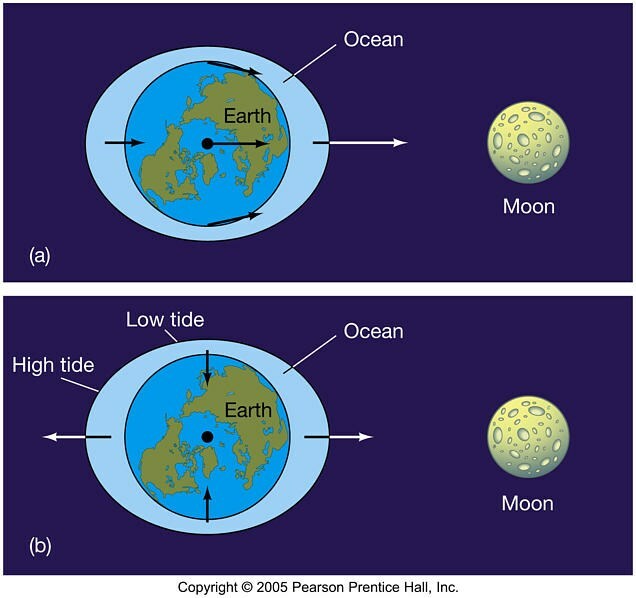 Tides and the moonHigh and low tides caused by gravity from the moon, and, less so, the sun.